From the old Hollywood chestnut of the Crystal Ball to the faceted spiky rods meant to channel healing energy, tuning into crystals has long been a psychic sensitive standby. Claimants of crystals importance to the psychic explain that the crystal tunes and focuses psychic energy, much in the same way it tunes and focuses—or in some cases, refracts—sunlight. For the most part, the concept of the crystal ball falls into the territory of storybook fortune tellers dressed as Gypsies and asking for those who would know the future to “cross their palms with silver.” Even today, however, there are those who vouch for the crystal ball and its effeteness in scrying the unknown. A sort of view screen to the paranormal, a crystal ball allows those tuned to its use—and possessing the appropriate psychic sight—to see events unfold in the future. 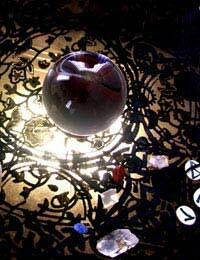 As such, the crystal ball is a tool for the ability known as precognition, or future sight. Depending on who is asked, the best crystal for psychic tuning is either specially shaped or left in its natural state. Either way the crystal is intended to amplify or fine tune an ability already in the possession of the bearer, rather than act as a magic item to allow those without abilities to temporarily use them. Crystals are typically used in healing rituals, where the ability to amplify and focus comes into play in the combat against disease. Not all forms of healing are physical, however, as claimants will use crystals to cleanse auras and spirits as well. In the Eighties it seemed that use of crystals by the psychic layperson skyrocketed, especially on the West Coast of the United States. California, while not the only popular place for crystals, was certainly one of the hottest. What used to be regulated to private rooms of the faithful were brought out into the light of day, and it was hard spotting a car on the highway that didn’t have one or more miniature crystals hanging form the rear view mirror. While magicians of the card trick variety are not above using crystals in their act, the kind of magicians most likely to attach real value to crystals would more accurately be labeled wizards. When the line begins to blur between the psychic and the magic, crystals are found aplenty. The belief that crystals are able to harness and modify energy crosses the line to magic as well, and many a magical rite involves the use of one form of crystal or another. Magical rites involving healing or harming, weather manipulation or the summoning of spirits typically use crystals as a material component of the spell. The belief that crystals can absorb, amplify, focus or redirect energy is plain and simple fact. One only has to hold a prism up in a beam of sunlight to see this natural aspect of crystals in action. The belief that crystals can perform the same feats with other forms of energy, psychic or otherwise, is a logical outcropping of crystal's natural properties.